The farming village of Celina is situated in the southwestern part of Kosovo, north of Prizren. In March 1999, during the Kosovo War, it was attacked by Serbian forces. Eyewitness accounts of what took place there were given as testimony at The Hague Tribunal in the trial of leading Serbian military and political figures. The following text is taken from the findings of the court ten years after the events. 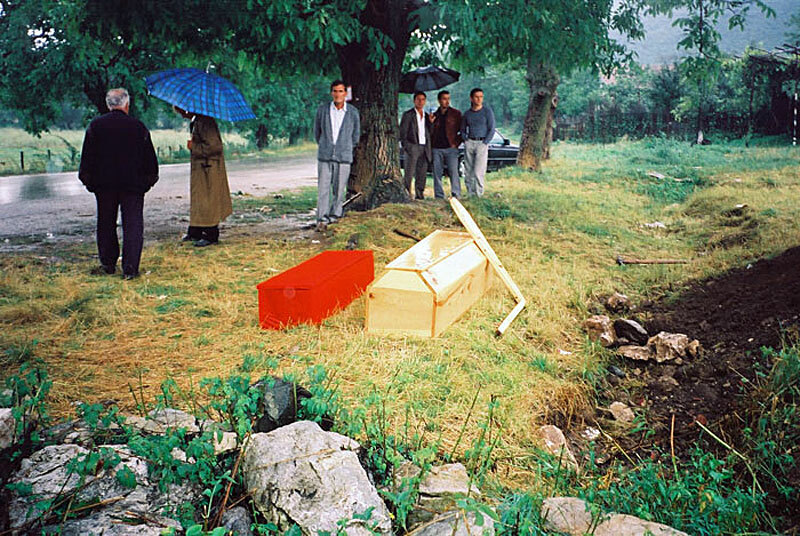 Burying the dead on the Plain of Dukagjin, at Lybeniq in Kosovo (Photo: Robert Elsie, 29 July 1999). 1. [Reshit] Salihi and [Agim] Jemini testified that “Serb forces” attacked Celina in the early morning of 25 March 1999. The village was first surrounded by VJ tanks, armoured vehicles, and APCs. Most of the villagers left their homes. Sometime between 5:00 a.m. and 5:30 a.m., the VJ began shelling the village, which continued on and off until about 9:00 p.m. that night. According to Jemini, it did not appear that the VJ was aiming at people in the village but rather that they were trying to scare them. 2. Salihi testified that the VJ shelled the village for a period and then stopped for a while, during which time the “Serb ground forces” entered the village. Once they withdrew, the shelling would recommence for a while. This pattern was repeated throughout the day. 3. Jemini testified that most of the elderly, women, and children gathered in one group; the younger men between 18 and 40 years, including himself, stayed away from this group, because they thought that they would be targets, and hid within the village. Most of Salihi’s family left their compound to hide in some nearby houses, and later went into the woods. However, Salihi, his brothers Bajram and Faik, Salihi’s wife, three daughters, and two young sons, stayed behind and were later joined by Miftar Zeqiri and 14 members of his family. They hid together in his farm compound. 4. Jemini climbed into the roof cavity of a new house and hid there with his cousin Isuf Jemini for about 48 hours. He could see about 80 per cent of the village, because the house was only partly built and the roof had a window. At about 9:00 a.m. “military infantry” approached on foot in lines of four, and by 10:00 a.m. they had surrounded the village. There were about 500 “soldiers” who came into the village from four main directions: Bela Crkva/Bellacërka, Velika Kruša/Krusha e Madhe, Orahovac/Rahovec, and from the direction of the main Đakovica/Gjakova–Prizren road. 5. Jemini testified that the forces that entered Celina belonged to the VJ and the MUP. The police who were present were wearing blue camouflage uniforms. The VJ forces were wearing brown-green camouflage uniforms with a two-headed eagle insignia on their left upper arm, and “various ribbons in various places”. Those who appeared in command wore dark green, beret style hats, and the soldiers wore hats that resembled “Partisan” style hats. All these hats had the same eagle insignia. Most of them carried automatic firearms and pistols. Some were carrying rocket launchers and some had grenades attached to their chests. Jemini indicated that some of the men wore blue uniforms with double-headed eagles on the chest. In his view, these were “usual police uniform[s]”, not army uniforms. Salihi testified that the “Serb forces” that entered the village itself were dressed in “black” uniforms; however, he was too far away to see the badges on the uniforms. These forces entered the village in armoured wheeled vehicles, accompanied by some tanks, which had tracks instead of wheels. Delić stated that all soldiers of his brigade wore uniforms called M-89, and the military police wore uniforms M-94, which were green camouflage uniforms. The Trial Chamber does not agree with the submissions of the Lukić and Lazarević Defences that the description of uniforms by Jemini and Salihi are not consistent with the VJ and police uniforms used at the time. Other witnesses also described police uniforms as black, and the Chamber recalls that the dark blue police uniform could be described as almost black in colour. The Chamber notes, however, that the forces seen by the witnesses may have included reservists, volunteers, and other irregular forces. 6. Salihi stated that he saw “the Serbs” set fire to houses and buildings in the village, including the village mosque. By the end of the day only about 20 houses had been spared. The “Serbs” also went into the houses, took all valuable objects, and loaded them on to their vehicles. Once the vehicles were full, they either smashed the remaining items on the ground or set them on fire. The “Serb forces” also stole cars and tractors. People were coming out of their houses and homes to run away to hide in the forest surrounding the village area. Jemini testified that the soldiers took up different points around the village; at each point about 20 to 30 soldiers were stationed. Some of the points were manned for about 12 hours until midnight; some of them stayed for about two days. Throughout the night the soldiers would shoot at random in order to scare the villagers. 7. At 9:30 a.m. that same morning Jemini saw about 35 soldiers break the gate of his compound consisting of five houses, which included the new house where he was hiding. After killing his dog, they searched all five houses and looted all the valuables. The commanders of the “offensive” were in a house that was about 10 to 12 metres away, opposite his hiding place. The commanders took their position on the balcony on the first floor, which was facing the house where he hid. Jemini was, therefore, able to hear all the conversations of the commanders. He also recognised their faces as soldiers from Orahovac/Rahovec, but did not know their names. From the balcony the commanders were supervising what was going on in the village. 8. Some soldiers entered the house where Jemini and his cousin were hiding and came up to the floor immediately below them, where they stationed themselves at the windows. Jemini was able to see this because there was a hole in the floor separating the two levels of the building. At the same time, he stated that it was very difficult for him and his cousin to move around for fear of making a noise and being discovered. However, he and his cousin would at times get closer to the window, while still keeping a safe distance from it, in order to see what was happening outside. They could take away the tiles from the roof to observe the village without the soldiers one floor below being able to hear them. Throughout the day, he saw soldiers entering and looting houses of valuables, and burning houses and the school. 9. Jemini was also able to hear the conversations these commanders had via hand-held radios, including the replies coming through these radios. Throughout the day, Jemini heard the two commanders giving orders over the radio to the soldiers in Celina. They appeared to be talking in a special code, and it was difficult to understand exactly what the orders were. The soldiers remained in the house until midnight. 10. At around 3:00 p.m. Salihi, who was hiding with his brothers and Miftar Zeqiri and his family in his farm compound, saw a large number of Serb policemen entering nearby houses and setting them on fire. They were wearing black uniforms and carrying assault rifles. His brother Bajram stood up to observe the movements of the police on the other side of the wall that surrounded the farm. At that time there were three bursts of automatic fire directed at their compound. Bajram was hit and killed instantly. Reshit Salihi ran to the house next door to his, which was part of the Zeqiri compound, and hid in a three-foot deep hole. A short while later he heard many bursts of automatic gunfire and screams of women and children coming from his compound. He heard men shouting in the Serbian language, of which he understood a little. One of them shouted, “Shoot, there are terrorists here”, which was followed by about 15 minutes of continuous shooting. After that it was quiet. Reshit Salihi remained hidden for several more hours, during which time he could smell smoke coming from his compound, which led him to believe that it had been set on fire. He came out of hiding when it grew dark and he made his way to the woods where he met up with his family. Upon his return to Kosovo from Albania three months later, he saw that the whole village had been burned. 11. When the evidence of Salihi and Jemini was put to him, Delić denied that he had any armoured personnel carriers in his units, or that his forces would have surrounded or shelled Celina. However, the “first clash” between the VJ and the KLA was in the village of Celina. On 25 March police forces “neutralised” the KLA in the village, and Delić acknowledged that his forces gave light artillery fire support, directed above the village along the elevations where the KLA trenches were located, without affecting the houses in the village. Vlatko Vuković confirmed this evidence, and stated that “strong fire” was opened from the village towards his left wing squad and the police unit, and that his units returned the fire, and the “terrorist” forces were “crushed” and fled. When he passed through the village later, around 10:00 a.m., police units had already searched the village and the “terrorists” had been “neutralized”. Vuković stated that he did not see any civilians in Celina at that time, nor did he see the VJ or the police burning houses, destroying mosques, or looting in the village. Some of the houses on the outskirts of the village had been prepared for combat. 12. Delić testified that part of his forces passed through Celina around 10:00 a.m. on 25 March 1999, following the police along the road leading from Bela Crkva/Bellacërka. In addition, a mortar platoon of 120-millimetre mortars passed through the village. It was not true that the soldiers came in lines of four. There was no longer any resistance in the village because the KLA had withdrawn along the axis from Celina towards Randubrava/Randobrava and Donji Retimlje/Retia e Ulët. 13. Witness SD1, a VJ officer, denied that his units took up positions in the yard outside the school of Celina on 25 March 1999. At that time the school was vacant and there were no civilians in that area. Later on in his testimony, however, he stated that he did see some civilians about 200 metres from the schoolyard that same afternoon. His units did not open fire with mortars on Celina on that day. He also confirmed having seen hundreds of civilians passing on the road from Celina towards Velika Kruša/Krusha e Madhe. 14. At about 8:00 a.m. on 26 March 1999 Jemini’s parents and other family members returned to the house looking for him. They told him that the soldiers had shouted at them, robbed them, and looted their houses. The soldiers told them that they should all leave for Zrze/Xërxa. He then noticed more forces approaching the village from the main road, including a troop carrier with 12 “special forces” police. He thought they were Arkan’s men; they had long beards and shaved heads with no hats. They had similar uniforms and insignia to those of the soldiers from the day before, but with red ribbons hanging from their left shoulders. They were similarly armed but also carried large knives on their hips. These men did not stay in Celina, but continued in the direction of Velika Kruša/Krusha e Madhe. 15. Jemini remained hidden in the roof where he had been the day before with his cousin, and his parents hid in the basement. Half an hour later there were about 200 to 300 soldiers in the village. Groups of them had red ribbons like the men that he had already seen in the truck. Others had white ribbons. Some groups had headbands. Some headbands were all red, while others were patterned but mainly red or black. They all carried long knives similar to the ones he had seen earlier. They went from house to house. 16. At about 9:30 a.m. around 30 soldiers entered his yard and searched every house. When they got to the second floor of the house in which he was hiding, they took up positions at the window and appeared to be guarding others. At that time he saw a group of about seven or eight men enter the house and remove five people who were hiding in the basement. These were his father Sadri Jemini, his mother Synavere Jemini, his uncle Shaip Jemini, his uncle’s son Muharrem Jemini, and his uncle’s wife Zade Jemini. The soldiers first asked them for money, then they marched them towards the gate of the yard. When they passed the next house, the soldiers ordered them to turn left so that they were between two houses. One of the soldiers took his pistol and shot one round into the air. The other soldiers then opened fire with their automatic weapons and all five of them fell to the ground. Agim Jemini was sure that they were dead. 17. A short time later a truck came into the yard. Soldiers stole valuables from Jemini’s houses and loaded them into two trucks. They remained in the yard until about 1:00 a.m. the following morning. Throughout the day they used flame-throwers to burn every house in the village that would burn. Only the new houses, which would not burn, were left. In Jemini’s compound three houses were burned; the one in which he hid and the one used by the commanders the previous day were left. Throughout the day Jemini heard the sounds of automatic weapons and the screams of men, women, and children. When the soldiers left, Jemini came out of the roof and escaped from the yard, making his way to Zrze/Xërxa via Bela Crkva/Bellacërka. He was not able to check on the bodies of his family members because there was a group of soldiers stationed about 50 metres away. 18. Reshit Salihi stated that he and his family remained in the woods for the next three days and on the morning of the fourth day a group of 40 policemen arrived on foot. They were dressed in blue camouflage pattern uniforms and had white armbands, and dark blue or green scarves on their heads. They were armed with assault rifles. When they started firing their rifles in the air, Salihi decided to bring his family out from the edge of the forest. Many people were gathered there at that time. The policemen ordered them to split into two groups, separating the women and children from the men. The policemen then started searching people and asking them to hand over their valuables, money, and identity documents. They threatened to shoot anyone who attempted to withhold any documentation. The “Serbs” then put all identification documents in a pile and burned them. The Lukić Defence submits that Salihi’s description of uniforms is not consistent with police uniforms used at the time. The Chamber recalls, however, that ribbons in different colours, including white, were worn at times by police acting in the municipality. The Chamber does not exclude that other irregular forces were there with the police. 19. Salihi testified that a villager named Agim Ramadani (about 22 years old) was searched and made to strip to the waist. Three policemen took him some 50 metres away, and one of them fired three shots at his head with a rifle, killing him. The men were ordered to put their hands behind their heads. Both groups were escorted back to the village in lines two abreast at gunpoint. During the march some people were kicked and assaulted with rifle butts. In the village they were handed over to another group of policemen who were dressed in the same blue camouflage uniforms and had dark green scarves on their heads. The policemen escorted them to the main road connecting Đakovica/Gjakova with Prizren and made them walk in the direction of Prizren, again at gunpoint. 20. After walking for about 30 minutes, the group was stopped for six hours. During this time they were constantly held at gunpoint. The policemen continued to demand money and assault them. At about 4:00 p.m. they were ordered to board some trucks that had arrived. The trucks drove them to Žur/Zhur, at which point they were ordered to disembark and walk to Albania. That evening Salihi stayed at a camp in Kukes where he was able to locate his wife and two daughters; the next day he and his immediate family were taken to a refugee camp in Tirana.